Hi Southern Anchors readers! Emily here from Life With Emily, a NC based life and style blog! I am so excited to be guest blogging for my blog (soon to be IRL!) friend Jennifer today. I am all about sharing on-trend, affordable items with my readers on my blog, so today I wanted to share some of my spring & summer essentials with you Southern Anchors readers! The best part is everything is under $100. Who doesn't love that?! + In the warmer months I always love carrying clutches. Lets face it, when it's hot outside the last thing I want to carry around is a heavy bag! This clutch is less than $40 and adds a fun print to any outfit. 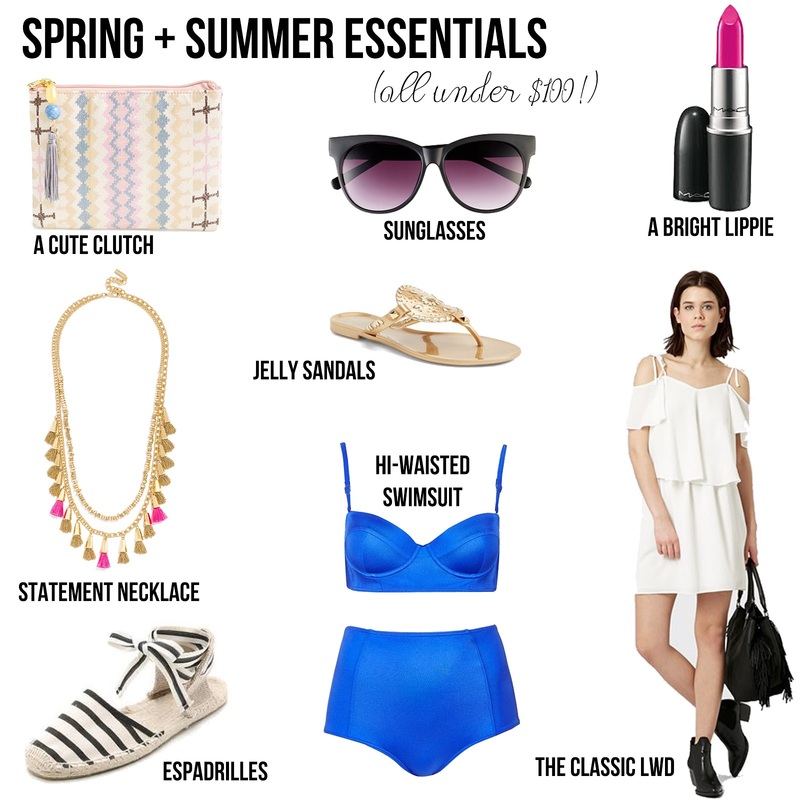 + Sunglasses are essential...always! As much as I love my Ray-Ban aviators, it's always nice to have a cheaper pair in case anything happens to them! + A bright lipstick can add so much to an overall look. I am currently loving MAC's Show Orchid, it's such a bright pink! + Statement necklaces (like this one) are the perfect way to add a little more glam to any outfit. + Did anyone ever think they would be wearing jelly sandals again? I thought those got left behind in the 90's, but apparently they are back! These jelly sandals are chic and don't remind me of my jellies from 1994! + Espadrilles are a warm weather classic. Soludos makes some of my favorites, like these striped lace up espadrilles. + A little white dress (LWD) in the summer is the equivalent of a black dress! If I can't find anything else to wear I will throw on a little white dress without fail. Thanks so much for stopping by! Be sure to check out Emily's blog :) Hope you're enjoying the posts this week!